We’re living in a Golden Age of Animation right now. The form has evolved and matured over the course of the past twenty years, and now we are reaping the benefits. Earlier this year, we saw the excellent French movie Triplets of Bellville, a great mixture of Gallic culture and Spike Jones records. In America, Pixar has had great popular and critical success, with Monster, Inc. and the two Toy Story movies being their best to date. There’s Richard Linklater’s Waking Life; there’s Satoshi Kon’s Tokyo Godfathers and Millennium Actress; and there's Mamoru Oshii, whose Innocence is about to be released here. At the core of it all lies Studio Ghibli, which blazed the trail and set the standard for everything to follow. Hayao Miyazaki’s 1997 Princess Mononoke topped $150 million at the Japanese box office (the top-grossing Japanese film typically draws around $30 million), following up a whole string of masterpieces. Now comes his 2001 movie, Spirited Away, the very best of the current crop of animated features. This is one of the sheer joys of the movies. I go to the theatre and pay eight bucks so I can see a grand sense of imagination, those creative flights of fancy that are all too rare. It’s a thrill to see the work of filmmakers who are truly creative, and Spirited Away has it in spades. Essentially, this is Miyazaki and Ghibli’s bold contribution to children’s literature, an Alice in Wonderland or a Wizard of Oz for the Japanese set. The plot involves a ten-year-old girl named Chihiro who, in a sense, falls through the looking glass, becoming ensnared in the realm of the spirits. Stubborn, whiny, a little “suburban” (I did not say "American"), she nevertheless starts to discover those talents, hidden inside, waiting to be released. The bulk of the movie is set in a Japanese bath house and draws heavily from their vast cultural heritage, their history, their religion, their mythology. In a sense, this is all a plea to the audience: remember who we are, and who we were. This is a deeply nostalgic film that seeks to reawaken its audience to its true identity, before Japan becomes nothing more than skyscrapers, bloated consumerism, and broken-down theme parks. This is a common Ghibli theme, actually, and it’s closest to Isao Takahata’s 1994 movie, Pom Poko, but Spirited Away is far more luminous, more colorful, more detailed. This is a joyous, optimistic film at its core, packed with details and surprises at every turn. The bath house welcomes visitors of every shape and size, radish gods and giant birds, small talking frogs and dragons. The soot sprites from My Neighbor Totoro are here, working in the boiler room and feeding coal into the furnace, under the supervision of a crotchety old man with spider arms. There’s a terrific moment early on, when Chihiro wanders in, looking for work (any visitors wishing to stay must find a job). After stumbling around, she inadvertently carries a heavy block of coal dropped by one of the soot sprites, taking his place. When the others see this, they look at one other and then, one after another, drop their own coals in turn. The old man starts shouting, but the sprites crowd around the girl in united defiance. It’s all wonderfully silly, like a comic Spartacus. 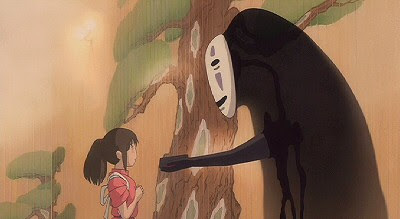 There are a terrific cast of supporting characters, including a young woman who takes Chihiro under her arm (the same two-sister setup you see in all of Miyazaki’s work); a mysterious boy named Haku, who’s carrying a few secrets, a giant baby who gets turned into a mouse, and a black-cloaked ghost called No-Face, silently clad in a mask straight out of the Noh theatre, who especially figures in heavily in the movie’s second half. The best of the bunch is Yubaba, the witch who runs the bath house. She a visual delight herself, a turn-of-the-century grandmother with an enormous head and sour disposition. She isn’t necessarily a villain per se; she “evil” in that Joan Crawford, Mommy Dearest sort of way. Miyazaki has no patience for simple-minded melodrama, anyway, and prefers an antagonist who is more complex and follows a certain code. Spirited Away really represents the great filmmaker at the peak of his powers. You see all of his skills on display, from a number of action sequences, to slapstick comedy, to old-fashioned Hollywood romance, to those quiet moments that Ghibli does so well. There’s an important scene – probably the best set-piece in the whole picture – that involves a giant, pulsating “stink god” and becomes a meditation on environmental pollution. It's an epic set-piece that probably captures all of Miyazaki's gifts at once. Here's another great moment that perfectly exemplifies this. It’s the scene involving Chichiro's train ride across what seems like an endless ocean, populated by shadows of working-class humans, on their way to the afterlife. It’s a slow, reflective, almost silent moment; a quiet pause in the action that evokes Ozu and Ray’s Apu Trilogy. A moment of pure visual poetry that would never be caught dead in a Hollywood studio picture. I like Chihiro; she's a great character, full of surprises and determination. We are presented with a character who shows more depth and growth than the young women in American movies. She's the center by which everything hangs on; she's our representative in this fanciful, mythic world, learning some of the harsher lessons of life in the process. We can identify. Spirited Away became Japan’s most successful movie ever, topping $200 million at the box office before acquiring endless awards and honors around the world. It also resulted in a long-awaited Oscar for Miyazaki, thanks largely to Pixar’s John Lasseter, who pretty much shoved it down Disney’s throats to get it released here. Can you believe that? Thankfully, the great movies have a way of finding their way to the people if you just respect them enough to give them a chance. Sprited Away is a truly great fantasy, and one of the finest films of recent years.